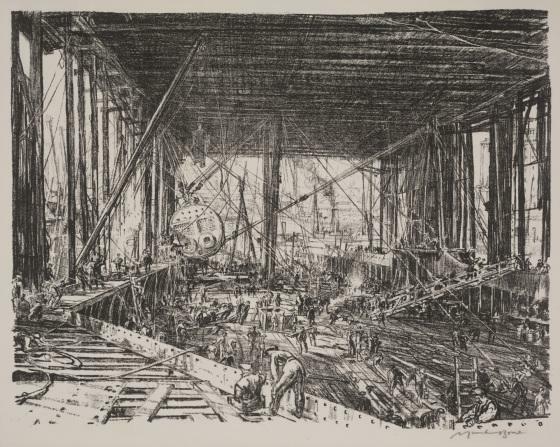 Text pages for the opera program "Victory Over the Sun"
Here shipbuilders are miniaturized by their setting, the half-built belly of an enormous ship designed to ferry entire trains. The cables stretched back and forth between the decks of the ferry emphasize the ship's complex structures. Sir Muirhead Bone was trained as an architect, and his talent as a draughtsman married well with his interest in printmaking. 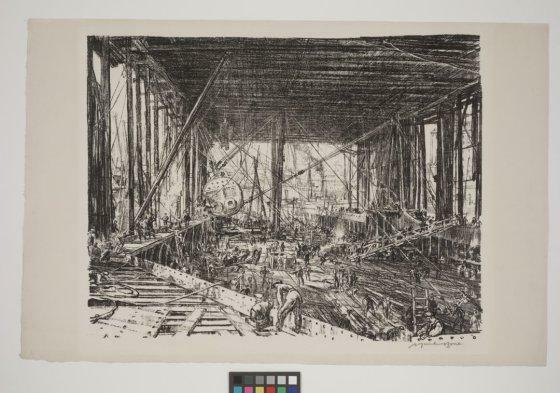 His most characteristic images were of construction and demolition sites, shipbuilding yards, and cities spoiled by war. During both world wars, Bone worked as an official war artist, documenting battlefields and the war effort at home.